There are moments when I look at my dolls and think “Maybe I’d like to add a new one to the doll family”. Let’s ignore the fact that some haven’t gotten an outfit changes in ages, or the fact that I have other more pressing financial goals/expenditures at the moment. We’re only going to focus on the fact that I sometimes have this want for a new doll. It often begins with Facebook. Now with Blythe friends having added me to the million and three about five different buy-and-sell groups related to Blythe, I get a lot of newly listed dolls and sundries posts all in my news feed. I try to be proactive and decrease the sheer volume of notifications and pop-ups in my feed by simply turning off the notifications (this works wonders for my sanity and my wallet!). Being around dolly people and getting to see fun and new dolls is always exciting. Being around dolly people and attending meets also helps to rekindle a bit of that Blythe love because I’ve been so wrapped up with work lately. There’s always a need to take a breather and to just reassess my hobbies from time to time. Do I need a new doll? Technically no, I don’t. I don’t need a new doll like I need the basic necessities. But do I want a new doll? Oh, definitely! I would definitely be lying if I said no. There’s something really fun about waiting for a doll to arrive in the mail. There’s the anticipation, the wait for a tracking number, and then the refreshing (and refreshing!) of the tracking number as you wait for it to show up. Maybe I just really like the anticipation of getting mail instead? It’s part of the New Doll Itch that I get from time to time. Buy some new sundries and hope that tides you over. What are your solutions to the New Doll Itch? I just have to buy a new doll. Right now I am jonesing for a JerryBerry, but she will have to wait another month. I put all my dolls in new outfits! It’s so time consuming and makes me appreciate the dolls I have. i live near a Blythe friend so we sometimes help each other with our big redressing task. When my dolly pal redresses my dolls for me she chooses outfits I wouldn’t have thought to do. And yet, here I am, still a one-Blythe person. I guess I would like to get another one, but there are so many factors surrounding the purchase of another. I’d have to be suuuuppppeerrr sure that a potential purchase would be a perfect addition. And of course, Blythes are expensive. I’m also afraid to make impulse purchases. People always say that Blythes don’t lose value, even if they’re not MIB. And yet, if you look at the BK forum, you’ll see the same dolls up for sale month after month. It seems that some dolls are hard to sell for the price they were bought for. I feel bad for those sellers, and I don’t want to end up with dolls that I lose interest in and have to make a loss selling them. I have the new doll itch all the time. I have made some impulse purchases in the past and regretted it. I was able to sell those dolls but for a tiny loss. Now I really give it more thought and make myself wait. I do follow groups on Facebook and watch for postings of dolls I thought I really wanted and after seeing more real life pictures, decided they were not the dolls for me. I also try and add dolls that are unique to my collection. So each one is different whether it’s short hair, colored hair, no bangs or with bangs. I have preordered the new Cherie Babette because of her short hair and cute outfit. She will be my fix for a while. Usually when I get the itch for a new doll, I try and find a stock outfit for sale. It has really helped. I dress one of my dolls up in an outfit from another release and I feel like I have a new doll. 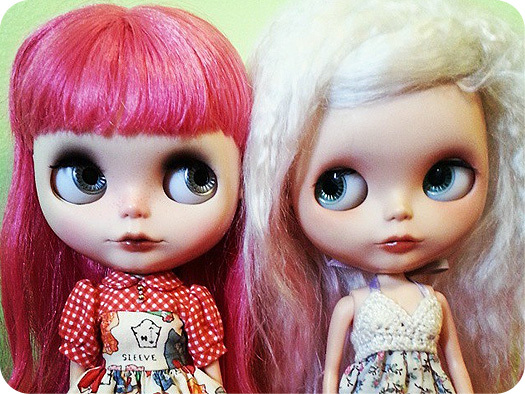 Make something for your Blythe! I’m not one to give advice though, as I just impulse bought another (my third) factory girl. It’s funny, because I have a list of like, 20 Blythes that I really want, and I’m especially pining for a Mrs. Retro Mama. Despite all my plans, I often end up impulse buying a doll that wasn’t even on my list! I’ve never regretted it, it’s just kinda funny- it’s like I hold off until I can’t take it any more and then just buy one as fast as I can!